1. First there was a wall. graffiti on the wall of their school in the town of Dara’a. This graffiti was perceived by local authorities as an audacious act of defiance and was fiercely opposed with brutality. The youth were arrested, interrogated and tortured. In return, the community was outraged over the students’ mistreatment and the government’s violent reactions. This lit the flame in the city and sparked the first uprising – an uprising that soon turned into an armed insurgency in most parts of Syria and led to government troops responding with brutality. In 18 months, thousands of people have died, with no clear end in sight. The month of August 2012 was the bloodiest so far in Syria. On the 25th of August, the Syrian Observatory for Human Rights announced 16,384 “martyr civilians” were killed. According to the Strategic Research and Communication Centre, at least 27,612 persons have been killed to date including 968 protestors killed under torture; 76,000 were missing; and 216,000 protestors are currently incarcerated. After this act and the arrest of the fifteen kids, their wounded bodies were excessively shown on public media. The torture marks on their skin evoked the graffiti marks on the walls; before February 2012, the wall in Dara’a’s school was silent and intact. An act of graffiti broke this silence and produced an irreversible moment of resistance – a change of reality. Since then, clandestine networks of resistance and spaces of endurance emerged as an alternative or perhaps an opposing reality by activists and grassroots movements in an attempt to survive and eventually reverse power relations. Graffiti is a clandestine act – a secret event that infiltrates the very controlled space of the state. Graffiti is often done in secret. It is a surreptitious repetitive act to reclaim space, and needs to be re-enacted and re-produced over and over again as an assertive inscription on the city. 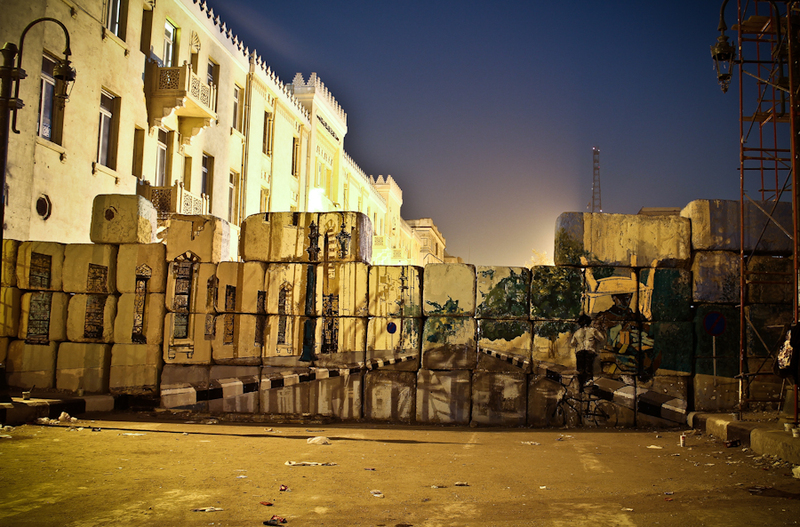 The Street has been central to the Arab Spring, acting as a space of mobilization and resistance. As we have seen in Egypt and Tunis, public space was appropriated as a form of political expression and graphic inscriptions. Yet in the Syrian case, the relationship between the street and popular resistance proved to be more complicated. Despite media representation, the place where the street was effectively appropriated as a site of resistance happened under the protection of the free army. And so, the street (as portrayed in the media) became a space of imagined projection, filtered out temporarily from the rest of the socio-spatial system. In fact, the actual street in its everyday sense (outside these protected areas) remained far from its potential as a collective site for popular mobilization and can be, at least until today, described as a controlled public space or in extreme cases as a site of crime. The unsafe reality of the street as a site for public gathering or expression has produced highly coordinated yet hidden networks of resistance and a certain clandestine space that escapes the persistent attempts by the regime to control space as well as disrupt, erase, and rewrite the everyday. In the past 18 months, desperate attempts from Syrian authorities to restrict movement triggered the most symbolic acts of defiance. However, most of these acts remained covert. Graffiti is one of these secretive acts. Daily-concealed practices were intended to reclaim urban space through the coordinated enactment of resistance in space and time. Activists coordinate their gestures leading to the disruption of existing order, benefiting from their intimate familiarity with the city and transgressing restrictions on time. In many ways over the past months, activists infiltrated the very controlled space of the state through networks of coordinated acts of resistance. These acts took place in private as well as public spaces. For instance, domestic demonstrations were proclaimed when district inhabitants acted together in time shouting slogans from the windows of their houses. Another example was the broadcasting of revolutionary songs by placing remotely controlled loudspeakers on the roofs of residential buildings. One of the most audacious acts took place on the 5th of May, 2011 when a group of young activists poured red dye in fountains of central squares across the heart of Damascus to symbolize Syria’s bleeding, to protest the killing of civilians, and in one case to explicitly symbolize the “blood of martyrs.” Two months later, on July 28, 2011, a group of young Syrian activists painted, gathered, and threw dozens of small Ping-Pong balls from the upper quarters of the Mouhagereen Mount in Damascus towards the Sikkeh. The balls were painted with anti-regime slogans (no to sectarianism; leave; freedom; etc.) This act, named “Freedom Balls” or “Courat El Hirriyeh,” was later performed in another neighborhood (Barada River in Damascus). The perplexed embarrassment of the security forces as they tried to control and collect the balls from the narrow streets of the city produced the absurd. Despite the extreme control by the state, they were actually unable to see the group and foresee the planning process because of the great secrecy that dominated the work. Also, most of these acts would require a high level of coordination. In the case of the “Freedom Balls,” one person would throw the balls while the other would record with a camera documenting the event. A third person would be responsible for securing the escape of the other two. Usually, funerals are peaceful collective activities. In current Syria, they have turned into clandestine activities. Many funerals take place in the middle of the night to avoid drawing attention and being attacked by the security forces. In this sense, Bouayda’s funeral becomes a temporary and secretly produced space. A short-lived activity, it is similar to the above-mentioned fleeting moments of marking the wall with graffiti or pouring dyes in the fountain. It is a transient declaration, very much present in the now as an anticipation of tomorrow. Al-Mo’taqal (Arabic term for “detainment prison”) is a parallel space constantly alive in the Syrian people’s consciousness. It is the ultimate controlled space by the state. For a long time, it was “there,” existing simultaneously alongside our reality – an underground prison, an oubliette, in the form of secret cells in the city, dungeons in jail and police stations. In our minds, the space of the Mo’taqal is enveloped in darkness; it is the “Other Space” that is authoritative and powerful. It is the Black Space – both literally and symbolically. Black in the sense that it embodies the absence of light and it can therefore be menacing, criminal, and evil. It has no nuances: A space of oppression, coldness, menace, and heaviness. Al-Mo’taqal is tight-lipped, unvoiced and hidden. Concealed: a space of subversion. Time in the Mo’taqal is also different; the dungeon space is unlimited: heavily present and permanent. It is always there. Yet paradoxically, the space of the Mo’taqal can also prompt symbolic acts of resistance in the sense of questioning the system’s disciplinary acts (e.g. hunger strikes, petitions), physical fear, and disfiguration (torture). In this case, suffering turns into a political statement or a form of resistance. Al-Mo’taqal in Arabic also refers to the person under arrest; a shadow of our existence. In the confined space of the prison, often enclosed within the walls, the body of the Mo’takal (“the prisoner”) is locked up, disciplined and contained in an the invisible twin space: a shadow space of the city.